Joe and Sharon are dedicated runners, spending between 7 and 12 hours each week on the road or trail, building up their endurance for those long ultra races. Joe is a 45-year old ultra runner (no, he's not a plumber and he's not from Ohio!) has a marathon time of 2:50, and 10K time of 37 minutes. He's been training consistently for 10 years, with few interruptions to his training, until now. He's been sick, completely bed-ridden for three months with pneumonia, finally recovered, and is now ready to start retraining. 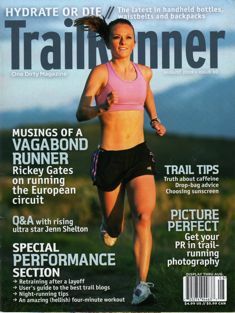 Sharon is a 30 year-old trail runner who's been running for five years, with a 10K time of 50 minutes. Her training has not been consistent as Joe's, and she's just got back from six month's backpacking around Asia. She wasn't able to squeeze in any running because of her travel, but did some walking and hiking through the jungle on occasion. Both fretted about how much hard-earned fitness they've lost, and are concerned at the long hard slog they face to regain their fitness. We all go through these downtimes when we're forced to stop training due to illness, injury, or travel. And we all notice when we return to running that our fitness is significantly reduced and it takes a long time to get back to our former training and racing fitness levels. Let's look at Joe and Sharon and what happens to their endurance fitness when circumstances force them to stop training. What does the research tells us about what happens when we detrain and then begin retraining? But first, some definitions: Detraining is defined as the partial or complete loss of training-induced adaptations in response to cessation of training or a substantial decrease in training load. Retraining is recovery of condition after a period of inactivity. The good news is that a few days of rest or inactivity will not impair Joe or Sharon's performance at all. The bad news is that there's a point where their fitness and performance does decrease with inactivity, and research shows it only takes about two to three weeks for the rot to set in. Let's start with the heart, as it's the engine driving Sharon and Joe's endurance performances. Changes to the heart from detraining are rapid and dramatic. Joe and Sharon's hearts experience a significant decrease in left ventricle dimensions, wall thickness, and mass, resulting in a lower blood ejection-only 4 to 7 days after stopping their running. These changes took months and even years to develop, and are undone in just days. Equally as dramatic are the associated reductions in their maximal oxygen uptakes. Consider these facts: after 2-3 weeks of detraining, Sharon's VO2 max, or maximal oxygen uptake, (the body's ability to process oxygen) decreases by 4%, performance times decrease by 2%-5%, and, sadly for ultra runners, the longer the endurance event, the poorer the performance, after any time off. Sharon's decline in V02 max will not be as steep as Joe's, because she's not as fit (so she doesn't have as much fitness to lose), and because she's not completely bedridden. However, in one study, female track athletes experienced a 15% drop in VO2 max after a three-month layoff at the end of their season, bringing their VO2 max figures back to their original untrained state. So Sharon's aerobic fitness, after 6 months vacation, albeit somewhat active, is back to that of her untrained self. Joe is much worse off. A well-conducted study found that completely bed-ridden people lost their VO2 max fitness faster than if they were active, but not training. The same study that found these declines found VO2 max declines by a staggering 27%, a reduction of about 1% of VO2 max per day. Joe's sub maximal heart rate declines after only 20 days bed rest, and his sub maximal stroke volume (or the amount of blood ejected from his left ventricle with each heart beat) declines 25%. His maximal cardiac output (the maximum amount of blood ejected from the heart in one minute) also drops by the same amount. The outcome of these changes is a decreased ability to transfer oxygenated blood from the lungs to the working muscles, and return C02 back to the lungs via the venous return system. Unfortunately for Joe, the VO2 max of very fit runners declines more and faster than less fit runners. As if this isn't disheartening enough, Joe and Sharon's blood volume and plasma volume decreases by 9% after 2-4 weeks, further contributing to the declining VO2 max figures. This is because their smaller stroke volume ejection causes reduced oxygen carrying capacity in their blood. Their muscle cell levels experience a decrease in the number of capillaries, the small arteries that deliver oxygen to the working muscles--partially accounting for their lower VO2 max figures. What about Joe and Sharon's fuel levels? Glycogen-- the fuel stored in their muscle cells and liver--is the life-blood for ultra runners. It provides a major part of the energy for endurance running, and enables fats to burn well during endurance events. Joe's glycogen content has decreased by over 40% after 4 weeks inactivity, and Sharon's only slightly less, say around 30%, because she's still active, (not bedridden like Joe). Since Joe and Sharon have stopped running completely, their percentage of slow twitch (endurance) muscle fibers may have reduced in number, according to some studies. The percentage of their Type IIa (endurance/strength) muscle fibers may also have decreased from 26% to 43%. What about Joe and Sharon's retraining time? Clearly, Joe, being fitter than Sharon, faces a steeper uphill battle to regain his fitness compared with Sharon. Highly trained athletes experience larger losses in VO2 and it also takes them longer to regain this fitness. Sharon has at least been active, and has less fitness to regain because she was never as fit as Joe. Regardless, the fact that both are back at their pre-training levels of (un)fitness, points to how critical it is that runners never stop training entirely, even in off-season. Highly trained individuals cannot afford long periods of reduced or no training because it takes them longer to get back into athletic condition. Ultra runners face this to the extreme. So Joe faces a long hard slog to regain his fitness, much more than the three months he was sick. It could take him up to 6 months to get back to where he was. Joe is also older, and there is some evidence showing that retraining takes longer as you age. What if Sharon was able to squeeze some training in on her vacation? As we've established, stopping training completely shows dramatic reductions in VO2 max. Reduced training, however, shows modest to no reductions for periods of 1-15 weeks, if it's done the right way. One study found if intensity of training remains unchanged, VO2 max. is maintained for 15 weeks when frequency and duration of training were reduced by as much as 2/3. Interestingly, when frequency and duration of training were kept constant and intensity was reduced by 1/3 or 2/3, VO2 max. was significantly reduced. Thus intensity seems to be the key for Sharon to maintain her aerobic fitness when she's faced with reduced frequency and duration, like when she's on vacation. She could maintain her fitness just by doing one or two short, high intensity running sessions each week, eliminating the need for retraining. The take home message from this is that ultra runners should never stop completely if they want to retain their aerobic fitness, unless sick or injured. At the very least some cross training should be included in their program in their off-season, and when on vacation, if your frequency of running is limited by travel, hit the road or treadmill hard for 20-30 minutes each session. Coyle, E. F., W. H. d. Martin, S. A. Bloomfield, O. H. Lowry, and J. O. Holloszy. Effects of detraining on responses to submaximal exercise. J Appl Physiol 59: 853-9, 1985. Coyle, E. F., W. H. d. Martin, D. R. Sinacore, M. J. Joyner, J. M. Hagberg, and J. O. Holloszy. Time course of loss of adaptations after stopping prolonged intense endurance training. J Appl Physiol 57: 1857-64, 1984. Houmard, J. A., D. L. Costill, J. B. Mitchell, S. H. Park, R. C. Hickner, and J. N. Roemmich. Reduced training maintains performance in distance runners. Int J Sports Med 11: 46-52, 1990. Houmard, J. A., J. P. Kirwan, M. G. Flynn, and J. B. Mitchell. Effects of reduced training on submaximal and maximal running responses. Int J Sports Med 10: 30-3, 1989. Klausen, K., L. B. Andersen, and I. Pelle. Adaptive changes in work capacity, skeletal muscle capillarization and enzyme levels during training and detraining. Acta Physiologica Scandinavica 113: 9-16, 1981. Moore, R. L., E. M. Thacker, G. A. Kelley, T. I. Musch, L. I. Sinoway, V. L. Foster, and A. L. Dickinson. Effect of training/detraining on submaximal exercise responses in humans. J Appl Physiol 63: 1719-24, 1987. Volaklis, K, H. Douda, P. Kikkinos, and P. Savvas, Physiological alterations to detraining following prolonged combined strength and aerobic training in cardiac patients. European Journal of Cardiovascular Prevention & Rehabilitation. 13(3): 375-380. June 2006.